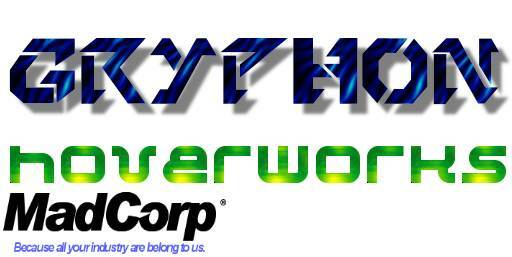 Gryphon Hoverworks is a hovercraft maker based in the Hyokia Industry Sector?, in the warehouse where MadCorp's famed PROJECT GRIFFIN took place. It began as a hovercraft tuning shop, creating modified and custom cargo crafts, such as the suped-up Thunder G? tow, or more notably the G1050, which is quite possibly the most capable hauler of any MadCorp craft. After a couple years of modifying MadCorp crafts, the company was bought by MadCorp, whom gave Gryphon's engineers the means to produce their own brand of high-performance hovercraft. Soon after, Gryphon used its innovative modification skill to create the GR-1, which represented not only Gryphon Hoverworks but MadCorp in general in zklipse craft races. Following changes in hovercraft regulations in the city, the GR-1 was slightly watered down to make it street legal, and Gryphon's high-performance craft arm was born. Gryphon's civil craft lineup includes the base-model Falcon?, the Panther?, the Talon, the Phantom, and the bleeding-edge GTR-7, which has replaced the GR-1 as the racing craft of choice for Gryphon. While the crafts are very expensive compared to those of Nakemura or CommieCorp, they are also capable of blistering speeds, on average upwards of 200MPH. Gryphon's main rival for the high-performance niche is Vortech, who has raced against Gryphon in zklipse since the GR-1 was introduced. Captain MAD Mike, CEO of MadCorp owns a collection of Gryphons at his various houses in the city. Mayor Syntax also drives a Falcon, which he keeps parked outside his Mansion. "I live for useless speed."